THE Saudi pharmaceutical sector reported strong performance, growing to $4 billion in 2013 from $3 billion in 2008, but challenges for the domestic sector remain, says a leading global consultancy. Roland Berger Strategy Consultants Middle East said the growth momentum would be maintained. Dr Plate noted that the healthcare budget as a percentage of GDP increased from 3.4 per cent to 4.9 per cent over the same period and currently, domestic pharmaceutical manufacturers account for a relatively small share of the market, only 18 per cent. Redesigning – The potential evolution of the value chain coverage of local pharma players implies that manufacturing might not be the core business for domestic players in the future, with possible outsourcing of manufacturing to low-cost countries gradually taking place. Domestic players should potentially focus on packaging, marketing, sales and distribution. Reconfiguring – A reconfiguration of the business model could translate into pursuing mutually beneficial partnerships through joint ventures, acquisitions and licensing agreements. Building brand equity –Manufacturers need to invest in product branding vs corporate branding. The assessment of branding and marketing strategies of niche products on a case-by-case basis, coupled with a holistic targeting of the entire landscape of stakeholders, is key to achieving optimal results. Recalibrating – A detailed activity assessment aimed at identifying the optimal scope and scale of outsourcing/offshoring selected activities is essential to compete in the generics market. “Ultimately, the best-positioned players will be those who understand their respective strengths and weaknesses and possess the strategic agility to navigate the changing landscape accordingly – only the fittest will survive,” Dr Plate concluded. 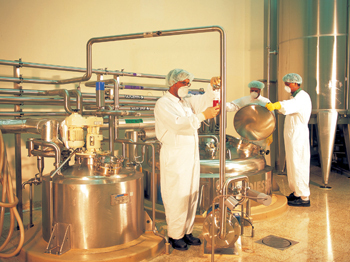 Meanwhile, Saudi Pharmaceutical Industries and Medical Appliances Corporation (Spimaco), a Saudi joint stock company, said its 65 per cent-owned subsidiary Dammam Pharma signed a contract to build a pharmaceuticals plant in the kingdom with Absal Paul at a total value of SR 134 million. The plant, to be built in Dammam’s First Industrial City, is expected to be completed in the second quarter of 2016.